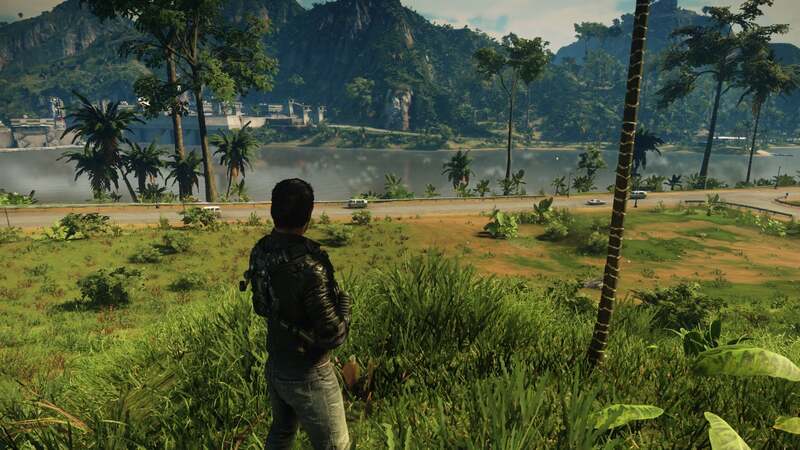 How am I supposed to focus on freeing Just Cause 4's fictional South American country of Solis from the grip of the Black Hand mercenary syndicate when the aftermath of every skirmish looks like a birthday party gone horribly wrong? 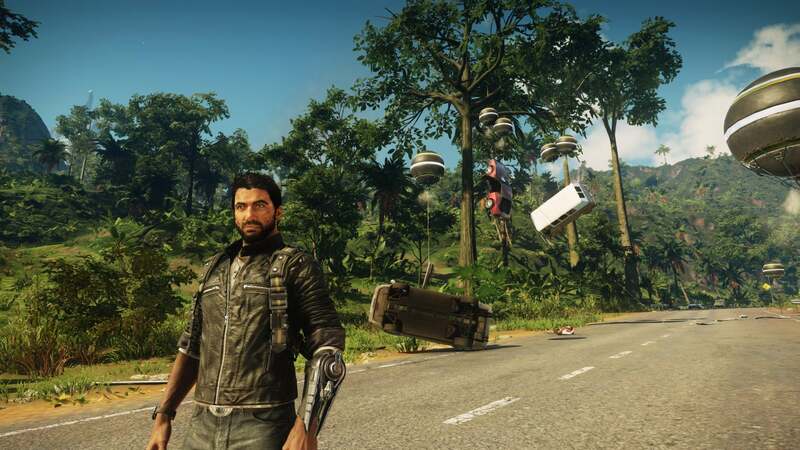 Just Cause 4 is an action adventure game with a story and everything, but the story isn’t the reason most people play. It’s about shooting, exploding, skydiving, wingsuiting and, new to the fourth instalment of the game, ballooning. 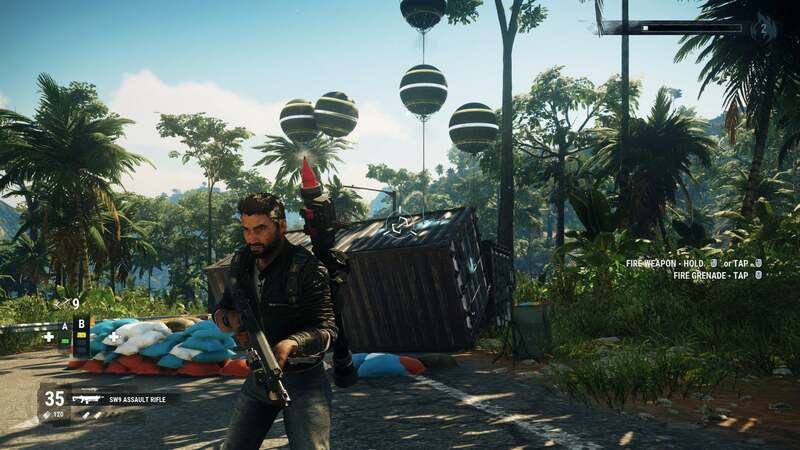 It’s valiant of the developers to give series hero Rico Rodriguez a reason to do the things he does, like discovering the secrets of his past or helping the local resistance overthrow their oppressors. As if we needed a reason, with such amazing toys to play with and pleasant scenery to explode. This screenshot taken within seconds of the opening cinematic ending. 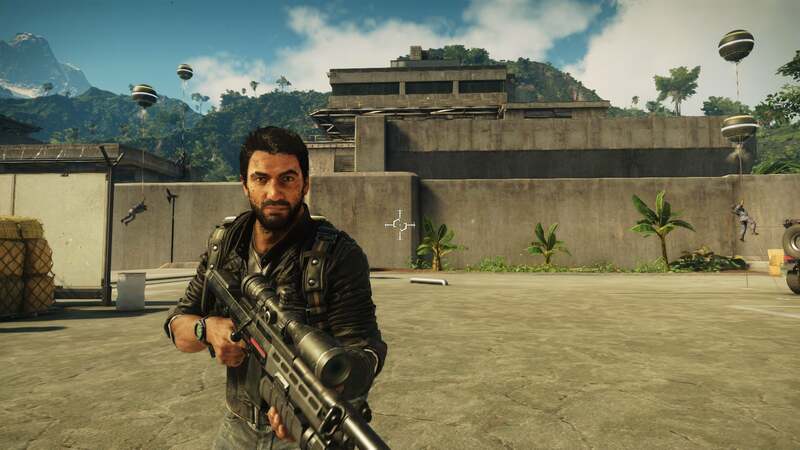 The series’ story missions are always better when they are used to introduce new toys for Rico to play with. 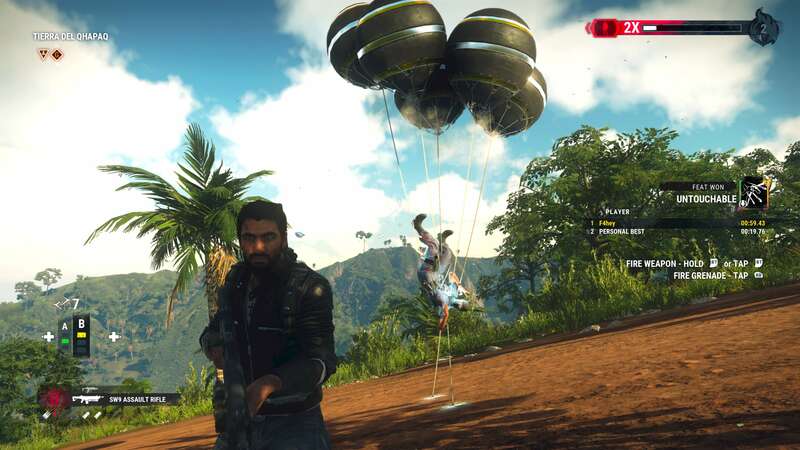 For example, in one of the earliest missions in the game, freedom fighter Sargento shows Rico some strange, inflatable ordinance he stumbled across. Rico, being an expert engineer, fits the new weapon to his wrist grapple within seconds, and boom. 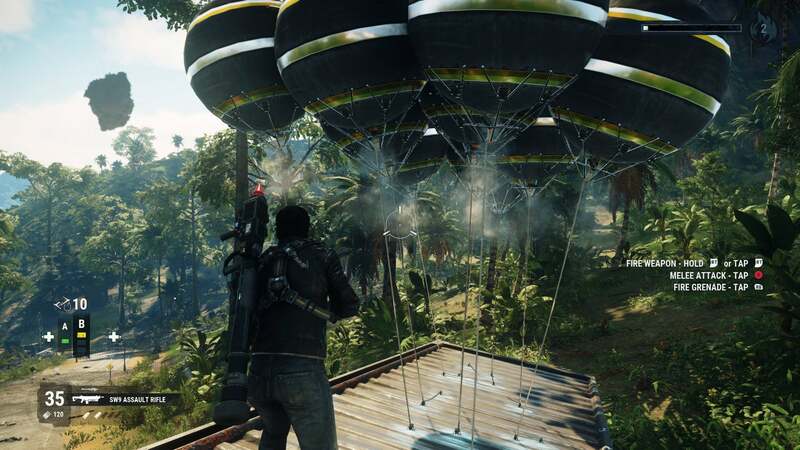 Much excitement has been drummed up about the weather effects in Just Cause 4, and I am sure the blizzards, sandstorms and tornadoes will be exciting when I get to them. But from the moment my new best friend Sargento granted me the power of balloons, I’ve been perfectly content causing as much floating chaos as I can. The weapon changes the way you see normal scenery in the game. Take this busy highway here. Normally this highway would just be something to cross to get to that enemy base, or maybe a convenient place to jack a vehicle. Armed with what the game calls the Air Lifter, it’s suddenly a festival ground with an endless supply of items to suspend gracefully in midair. Each new object encountered becomes a new game of “I wonder how many balloons it will take to float that?” This shipping container took a bunch of balloons to get off the ground. Mind you the Air Lifter can be configured with three different balloon sizes—small, medium and large—so if you need more lift, the option is there. It’s great for creating impromptu airships. What about combat, you ask? The Air Lifter is not just a toy, but a weapon as well. In the right hands, it can be the ultimate non-violent solution to armed conflict. 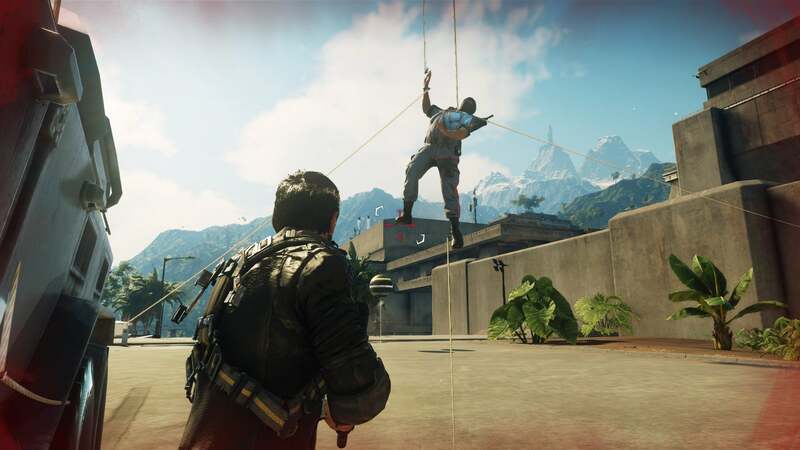 This enemy soldier is still alive, because Rico values human life. Or it’s just funnier when they struggle and curse. Plus, it’s much easier to kill them when they are suspended in mid-air along with an assortment of vehicles. 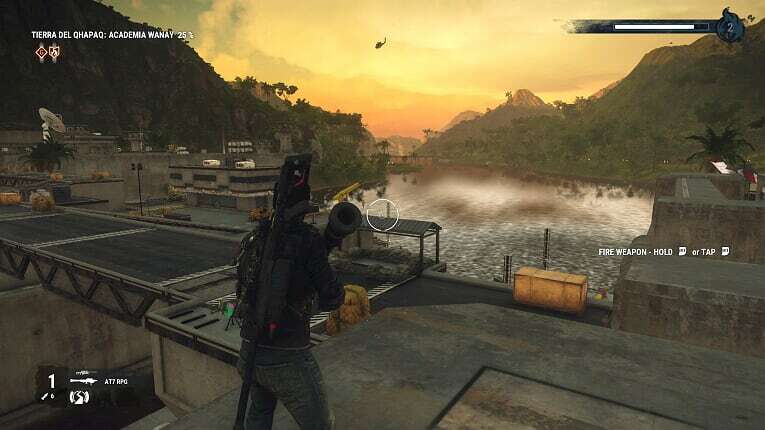 To be honest, I am having so much fun with this silly toy, I might never get around to a full review of Just Cause 4. That would involve pausing my balloon party planning to partake in missions. I’ve done a few, and several have already involved escorting folks while they’re being shot at. That’s no fun. It would also mean I’d have to stop messing about and start paying attention to serious things. Things like the bugged wildlife, with flocks of birds suspended in straight lines across the sky. 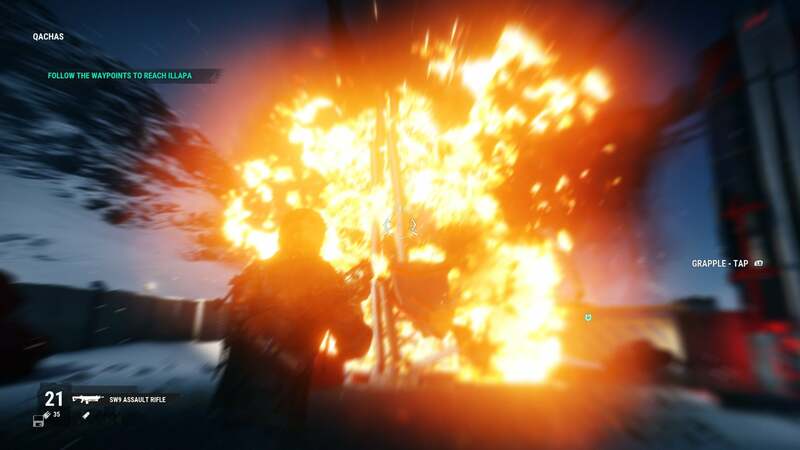 Or the occasionally muddy graphics on my Xbox One copy, ruing the game’s otherwise lively and colourful palette. What is going on with the water back there? No, I’d rather just revel in the chaos. It’s the series’ primary draw, after all. I’m going to just sit back, relax and enjoy hilarious Highlight Reel clips for months to come. Sorry to leave you all hanging.